There are plenty of people who still reminisce about the days before airport security checkpoints were a thing, when they could kiss loved ones at the gates and all of that junk. But soon, we’re going to long for the days of more privacy: The TSA will soon make travelers tear apart carry-on bags at security. The details aren’t clear on what exactly we’ll all have to pull out of our bags, but the Wall Street Journal reports that the TSA is currently testing new regulations that include putting food and electronics bigger than smartphones in separate bins to go through security. Other changes include using machines instead of manual checks for traveler ID cards, according to the WSJ. But breathe, because the WSJ reports the changes aren’t finalized and decisions will be made in a few weeks. The new regulations, the WSJ reports, will go into effect after the summer travel rush so that TSA employees have time for new training. So, we at least have a few more months of only semi-painfully slow security procedures at the airport. After that, things will get really... not fun. The regulations are also expected to come only for standard security lines rather than TSA PreCheck, which is a headache. For anyone who may have bad motives at an airport, not only is it a strike against everyone’s safety for people to know that the current check system might not be living up to standards, but that they can pay an $85 fee and get a background check each time a membership expires to be regarded as a “trusted” traveler and bypass a deeper security screening. To add to that concern, the TSA is notorious for failing to detect things. The WSJ cited history of it in government tests, and you can just see for yourself here: In June 2015, CNN reported that the TSA didn’t detect explosives or weapons; later that month, the LA Times reported that the TSA’s failure rate in detecting fake weapons in government tests was 95 percent; and in 2016, U.S. News reported that a man traveling to Detroit claimed he accidentally brought a loaded gun onto the plane in his bag. He said he didn’t notice until he was on the flight. For non-PreCheck travelers, some of the potential regulations being tested by the TSA make more sense than others. Some are just plain weird. The WSJ reports that tests began at small airports—with fewer people to hold up, of course—and that a lot of travelers have been confused by it all. The WSJ reports that one of the tests in May even included removing paper from carry-on items, all the way down to the notepads. That one reportedly didn’t go well and ended not long after it began. 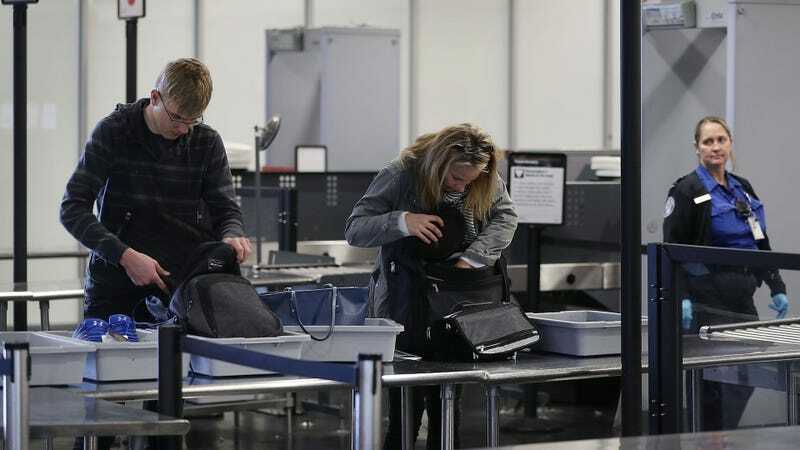 According to the report, part of the reason the need for further measures is on the rise is because we as travelers continue to load our carry-on bags more as fees for luggage go up. That popular goal to lower expenses, in turn, makes it harder to check the bags we carry on. In the big picture, it makes sense. We should be concerned with our expenses, while airport security—as well as we as travelers—should be concerned with our safety. But if passengers can pay a fee to bypass such an inconvenience, one has to question if our safety is really the top priority here.